Eassos Recovery - Best data recovery software, powerful and ease to use, the most widely used data recovery software! When you encounter the situation of data loss, it is a good idea to choose a piece of data recovery software and recover data by yourself. It is convenient quick and saving money, for it saves time and effort. When you search for "data recovery software" on Google, you'll find too much data recovery software, thus how to choose one among so much data recovery software? Which is the best data recovery software? Now, let me introduce you an excellent data recovery program - Eassos Recovery. This is exactly the best data recovery software you are looking for, believe me, that's true! In the following part, we'll make a detailed introduction of the software. Accidental deletion of files. 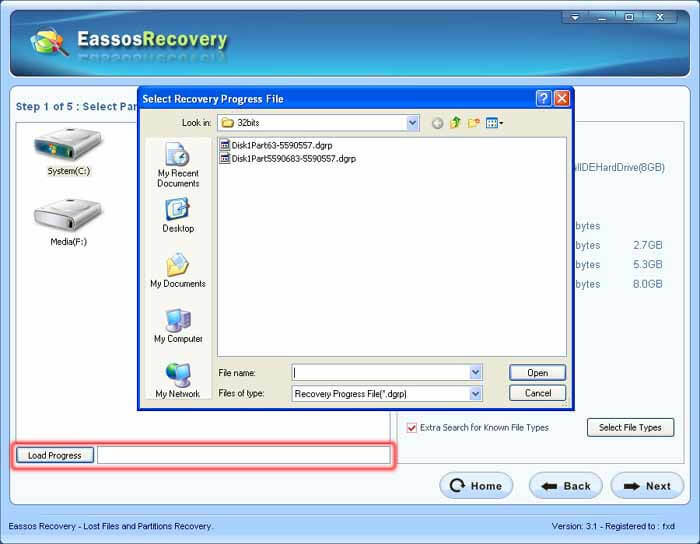 Use the mode "Recover Deleted Files"
Besides, you can click the following link to learn how to recover data with Eassos Recovery step by step. It has powerful functions, supporting many kinds of data recovery modes as shown below and flexibly adapting to a variety of data loss situations. Recover files by scanning a specified partition when the partition becomes inaccessible or accidentally formatted. Search for lost or deleted partitions. Then recover the files from the partitions or repair partition table immediately. Recover files deleted or emptied from recycle bin. Recover files from a specified disk, when the disk was wrongly partitioned and can not recover partitions directly. 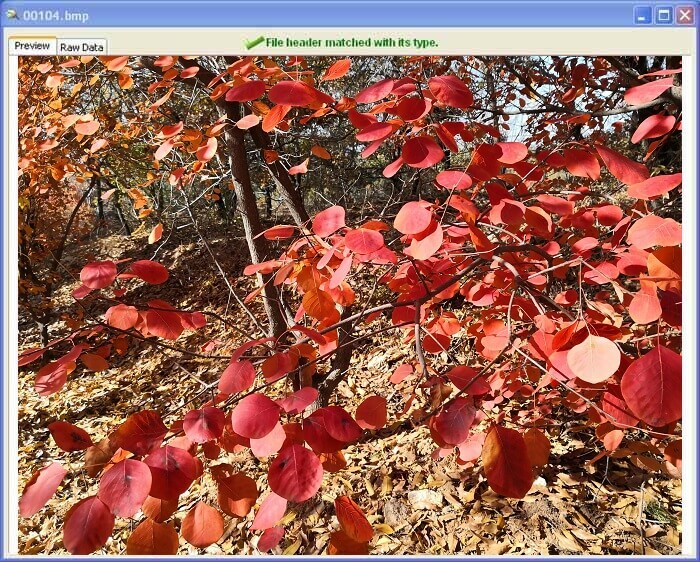 It supports all sorts of virtual disk formats and GUID partition table, and it is also compatible with Windows 7 64bit. 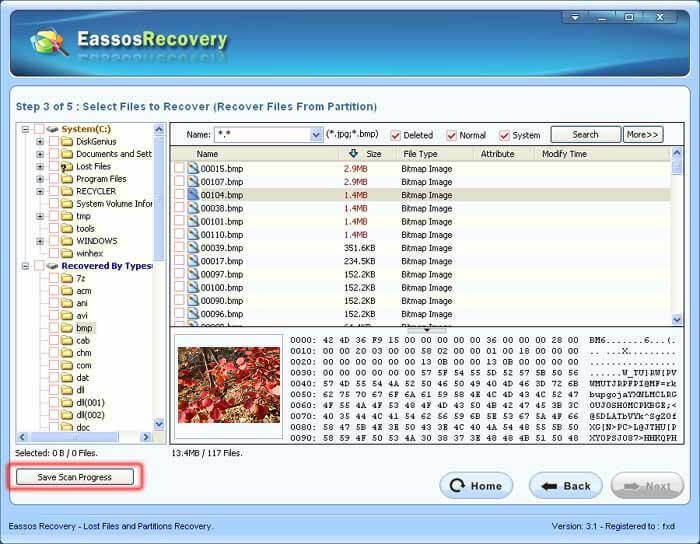 Eassos Recovery is very easy to use, and its wizard interface enables you to become a data recovery expert in minutes although you aren't a computer master. The interface of Eassos Recovery is wizard-styled, so in the process of data recovery it'll prompt you how to operate step by step, and you just need to click the mouse several times according to the operation hints of Eassos Recovery to recover lost data conveniently and quickly! 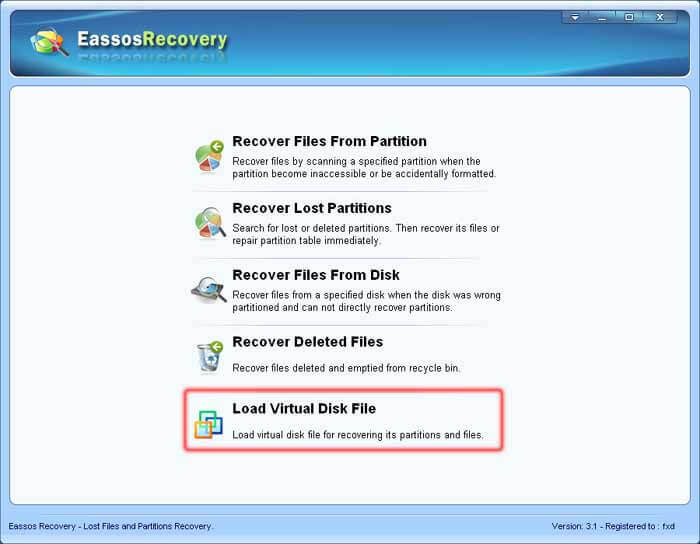 Eassos Recovery has a free version by which you can recover data free of charge up to 1GB! The free version doesn't differ from the professional version in recovery function, for the free version can recover all the files that the professional version can recover! Although you aren't an expert in computer or data recovery, just by a looking at the recovery modes on the main interface you'll know how to make a choice. Having selected the data recovery mode, you can recover data step by step in accordance with the prompts given by Eassos Recovery's wizard interface! It applies to the partition to be recovered, whose drive letter still exists, and it is just accidentally formatted; or due to some reasons it can't be accessed (Windows prompts that the partition needs formatting or it is damaged). On such occasions you can use this recovery mode "Recovery Files From Partition"
When the drive letter of the partition to be recovered doesn't exist, you can use this mode to recover partition and its data. Usually, virus, incorrect operations and so on may cause partition's drive letter disappeared. Moreover, when using backup software like Ghost to recover operating system, careless operation may cause original partition lost. In this kind of situation you should also use the "Recover Lost Partition" mode to recover partition and its data. 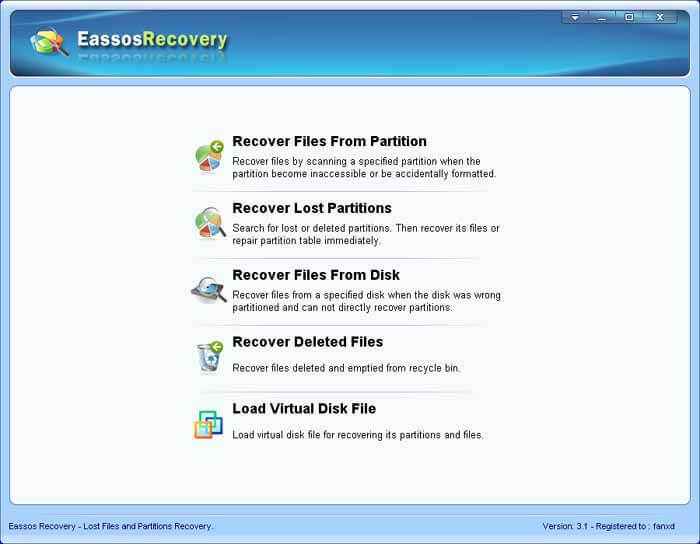 Partition recovery, the best function of Eassos Recovery, is highly acclaimed by users. You can use this mode when the hard disk is damaged seriously or the recovery results of the first two modes are not very good. 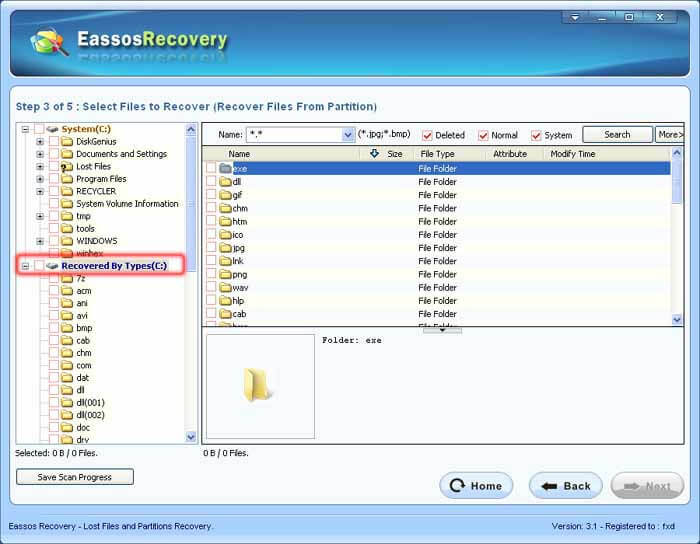 In this mode, Eassos Recovery will scan the whole hard disk thoroughly and search for partitions and files; however, users should pay attention that this recovery mode will take Eassos Recovery a long time to do scanning, so you should be patient. If you just delete files or folders by accident, please first try the "Recover Deleted Files" mode. In this mode, Eassos Recovery scans very quickly. If you are lucky, you can find your mistakenly deleted files within a minute! Eassos Recovery supports, besides all formats of image files, the preview of text files and Microsoft Office files (Word, Excel, PowerPoint...), which makes the function much more practical. In general, no matter which data recovery mode you adopt, Eassos Recovery will scan out many files and directories from partitions, thus how to select files and directories you need to recover from the scanning results? Eassos Recovery provides many practical functions, which makes it easy and convenient to find out files and directories you need! It will take a long time to scan partition and disk when the hard disk capacity is very big and there are too many files and directories on the hard disk. It'll also take user a long time to find out and filter files to be recovered when there are too many files and directories scanned out For this reason. At present, more and more people use virtual disks, but once the data on virtual disk losses, it'll be more troublesome. 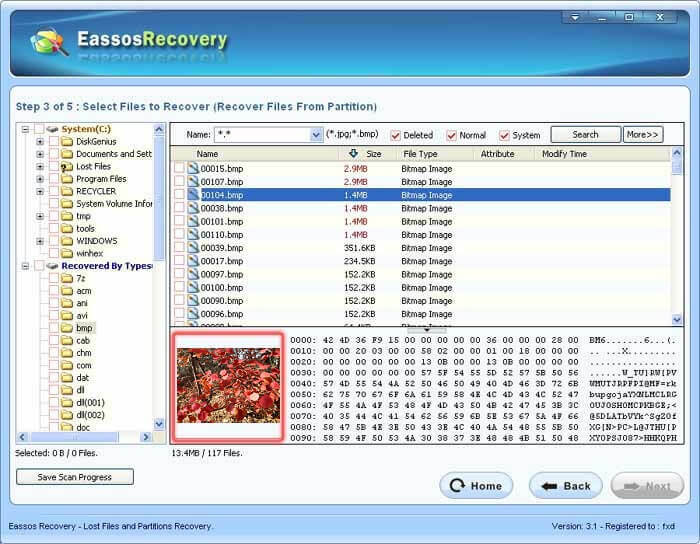 To get a better understanding of the excellent functions of Eassos Recovery, the best way is definitely using it in practical to recover data; click the download link below now to experience its magical functions! If you are an expert in computer or the data recovery field, another piece of software, PartitionGure, may fit you better. PartitionGuru's functions are more powerful than Eassos Recovery and it is more flexible in use. To know more about PartitionGuru, please visit the hyperlink below.